We are excited to welcome pets home to 3Sixty Flats! Visit our community dog park, where everyone knows your dog's name! Elmer W. Oliver Nature Park, a favorite local spot for dogs of all ages and sizes, is only 3.5 miles away. 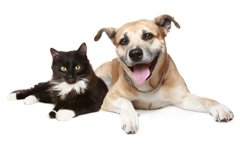 We are also pleased to offer pet stations in convenient locations around the community.